I NEVER would have used a leash on my children. Then I had Brian . . .
My sympathies. Let those snide comments roll right off you, sister. As long as you go home with the same number of children you left with, you're doing alright. Screw those people and their opinions. They have no idea what it's like to be in our shoes. I had harnesses with Cole and Bella and I happily used them with Garrett and Landon when they finally learned to walk/run. One mom came up to me at the park and told me how cruel it was to make them wear "dog leashes" and I said, "Uh, no....real cruelty would be letting them run into the busy street over there and letting them get crushed by a car." Oh, girl .... I tried the purse/leash thing with Rachel when I was PG with the twins, and I wanted to cry. It was like walking an extremely bad puppy. She'd go one way, and I'd go the other. I'm sure the folks at Target thought I was nuts. For me, it was a good idea in theory, but just did not work for us. I parent a single well behaved child that is easily controlled by verbal commands. And I confess that I'm guilty of sideways glances when I see the kids on leashes. I can't imagine though how you could keep twins together in a crowd (like SeaWorld) so I agree. If that's what it takes, do it. Safety and sanity are more important than public opinion. I have that exact same safety strap. And I too have be shamed, or attempted to be shamed by other people. People who say they would never treat their child like a pet (but funny how they treat their pet like a child.) But one trip to DisneyLand where you lose your child and you are sure they have been kidnapped by a creepy man who lives in a van and the strap is completely worth it. I never had an opinion about harnesses until a year ago when I was dating this guy and we got into a discussion about them. 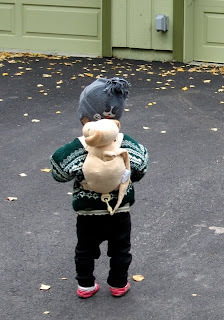 He thought using harnesses or safety straps or whatever was a horrible excuse for poor parenting. I suddenly became defensive and said that I have seen enough unruly kids to know that sometimes they are necessary, no matter how hard the parents work to instill discipline. I wanted to purchase one for Jacob a little while back, but Kevin just laughed. He said I can do what I want, but I could tell he didn't want to be caught dead with a 'monkey on his child's back'. So now I'm the one who grins and bears it as my child writhes in my arms as we leave any public place. Lucky me! Could not agree with you more! 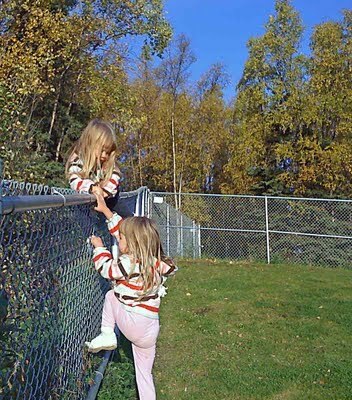 In fact I keep my twins b/g on leashes all the time! 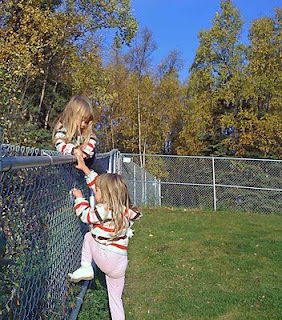 Love the picture of them climbing the fence! Man these critters can be industrious!